Retrogaming is still the news! We have created a new section to allow you to play the old games of the 80s and 90s. These games are not dying and are still hot today. However, they have become rarer and are harder to find. Surprisingly, you can still find vintage consoles in new conditions. One of our goals is to list where you can buy easily the hardware. 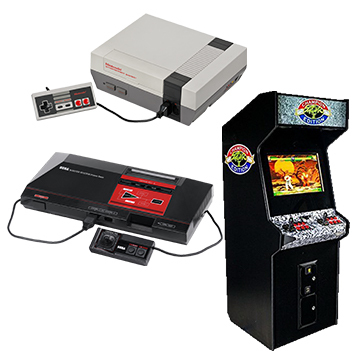 So far, we have listed a few vintage retro gaming consoles and a few arcade machines. More hardware is coming during the next weeks. We will keep adding new stuff regularly as we find new gaming gears. This market is also flourishing. Because the vintage gaming consoles and vintage arcade machines are not in production anymore, many companies have come up with a new kind of hardware. For the consoles, you can play your old games on clone retro consoles compatible with the original old games. For the arcade machines, you can play thousand of games on one single multi-game arcade machine. To get more information, visit the retrogaming section.